HSE figures show that an average of 250 employees and self-employed people are killed each year as a result of accidents in the workplace, with a further 150 000 sustaining major injuries or injuries. Over 2.3 million cases of ill-health are caused or made worse by work, leading to over 40 million working days lost through work-related injuries and ill health, at a cost to business of £2.5 billion. 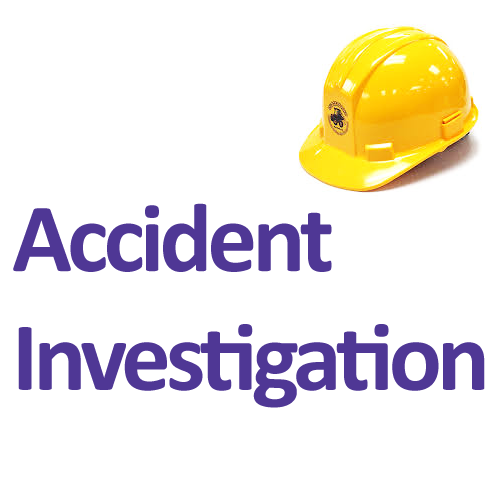 In carrying out accident investigations we will provide you with a deeper understanding of the risks associated with your work activities. Blaming individuals is ultimately fruitless and sustains the myth that accidents and cases of ill-health are unavoidable when the opposite is true. Very often there are many layers to accident causation. There is an Immediate Cause - e.g. Pete fell off the ladder and broke his leg There may be an Underlying Cause - Pete did not have a well-maintained ladder Then there may be a Root Cause - possibly a management failure for failing to give Pete adequate training in working at height, ladder inspections or failing to provide more suitable equipment. An accident investigation will enable you to design better risk-control measures and, combined with adequate supervision, monitoring and effective management (i.e. your risk management system) will ensure that your work activities are made safe. Accident investigations are an important tool in developing and refining your risk management system. Powys Safety Solutions, 16-17 Longbridge Street, Llanidloes, Powys, SY18 6EE U.K.